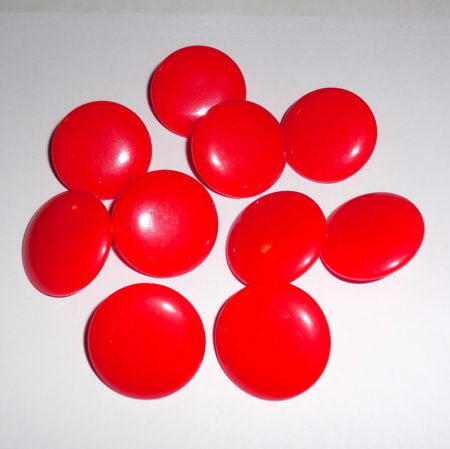 5 Pairs Vintage Cherry Red Bakelite Pierced Post Earrings – This is a group of tested and guaranteed bakelite earrings in cherry red color and large 1.18″ size. They are from the 1970s to 1980s and have a lacquer finish. So, in order to test them properly we cut one extra earring and were able to smell the burnt electronic smell associated with bakelite. We also simichrome tested the inside. Additionally, the earring charred but did not melt when placed over fire. They are deep cherry red color, much truer red than the photo could capture. Unknown if they were ever drilled. 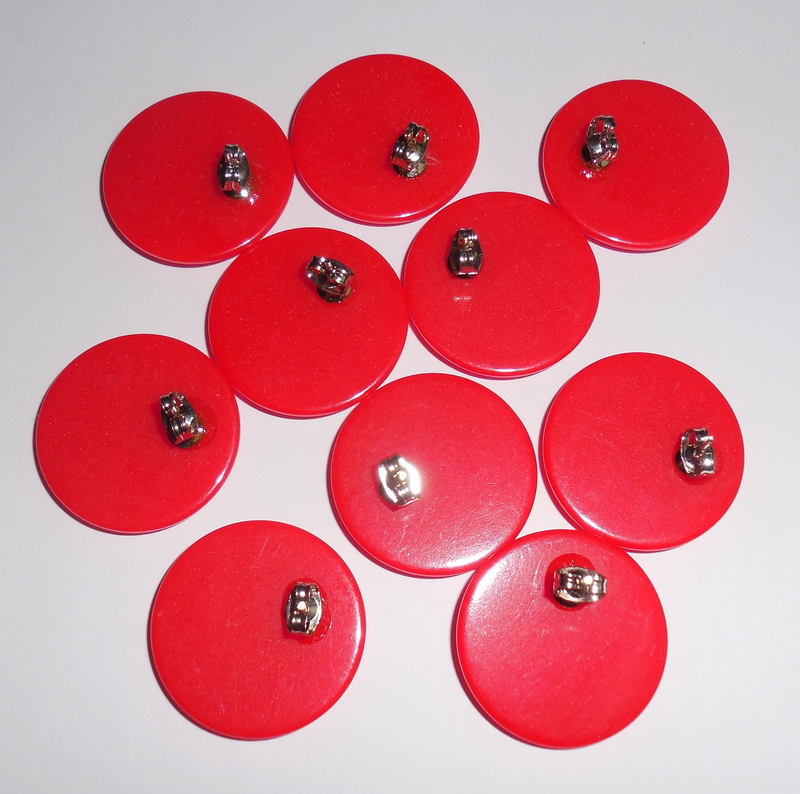 They have strong and securely glued backs with silverplated covers and posts and stainless butterfly catches. Any glue marks you may see in the enlarged photos are not eye noticeable when the earrings are worn on the ear. All are in excellent, condition. Old store stock from an establishment in business from the 1960s to 2005 and were stored away for decades. 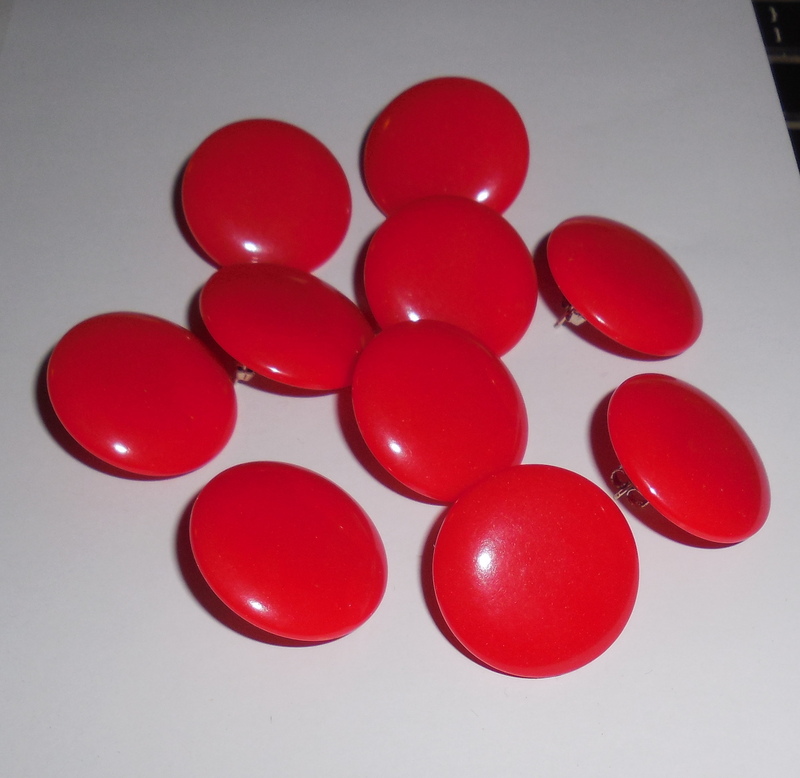 Lovely group of 10 pieces of vintage bakelite for you and yours! They are large colorful and showy! 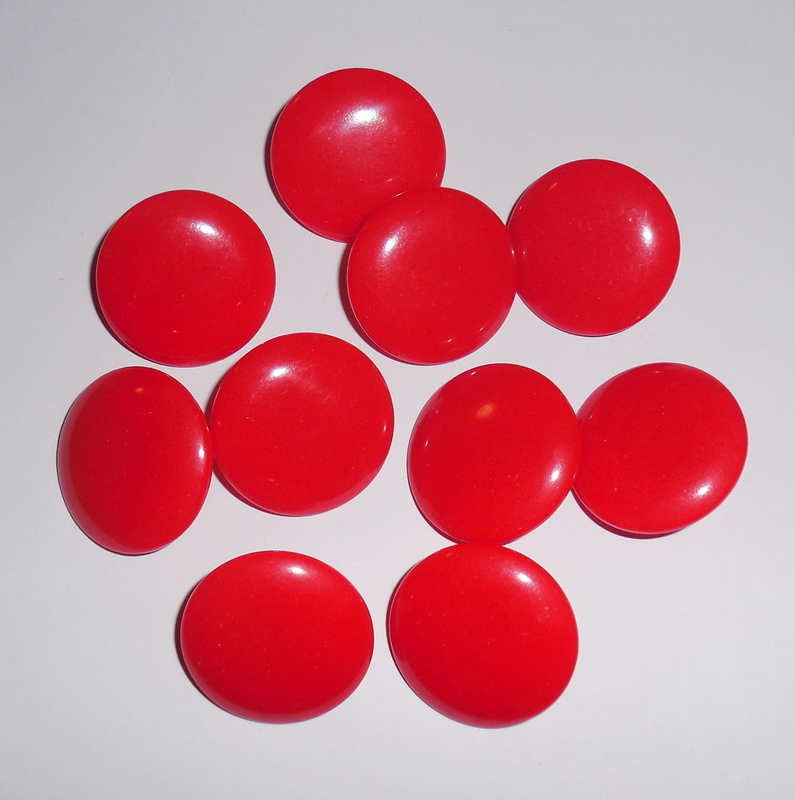 5 Pairs Vintage Cherry Red Bakelite Pierced Post Earrings – This is a group of tested and guaranteed bakelite earrings in cherry red color and large 1.18″ size. They are from the 1970s to 1980s and have a lacquer finish. So, in order to test them properly we cut one extra earring and were able to smell the burnt electronic smell associated with bakelite. We also simichrome tested the inside. Additionally, the earring charred but did not melt when placed over fire. They are deep cherry red color, much truer red than the photo could capture. Unknown if they were ever drilled. They have strong and securely glued backs with silverplated covers and posts and stainless butterfly catches. Any glue marks you may see in the enlarged photos are not eye noticeable when the earrings are worn on the ear. All are in excellent, condition. Old store stock from an establishment in business from the 1960s to 2005 and were stored away for decades. 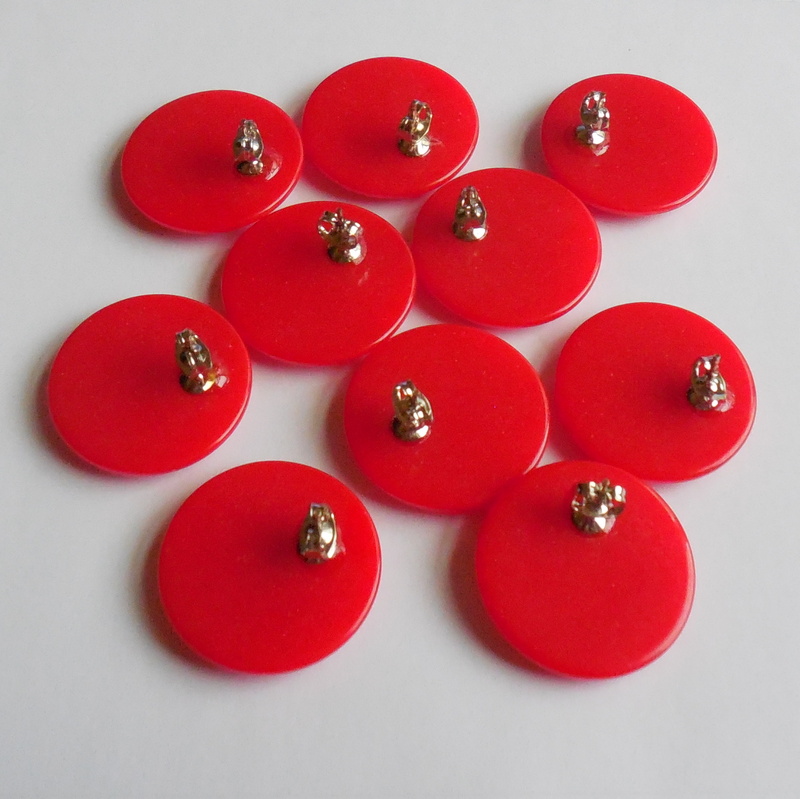 Lovely group of 10 pieces of vintage bakelite for you and yours! They are very large colorful and showy! 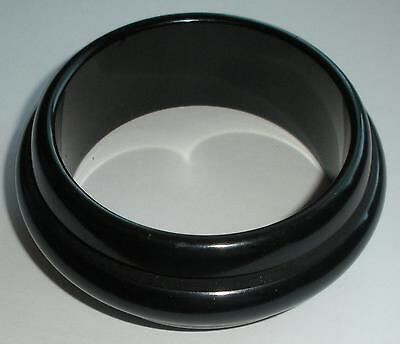 This is a very large thick chunky 1950s-60s late Art Deco black bangle bracelet; looks and feels like old heavy bakelite but does not have the distinct odor of bakelite. Old, original and from an estate of a jewelry manufacturer. It has deep recesses that are matte finished,never polished out and could be used to hold rhinestones. Condition is excellent having very few minor scuffs and 1 tiny pinpoint ding. Could be worn the way it is or just add decoration in the recess for a more rare and unusual bracelet. Size is 1 3/16" wide across. Thickness is almost 5/16". Diameter across the inside opening is 2 1/2". The inside circumference is almost 7 1/2" around. Vintage Sarah Coventry 2 Row Faux Pearls Bracelet M Medium size. It is signed Sarah Cov and is a gorgeous example of faux pearls vintage jewelry. The double row of pearls are lovely. No wear to the gold. No wear to the pearls. Still very crisp, clear, clean and lustrous. Between the pearls are rows of fancy gold chaining. The pearls are 8mm each. Size is 7 3/4" end to end with clasp closed. Width is just over 1". Better than excellent condition! 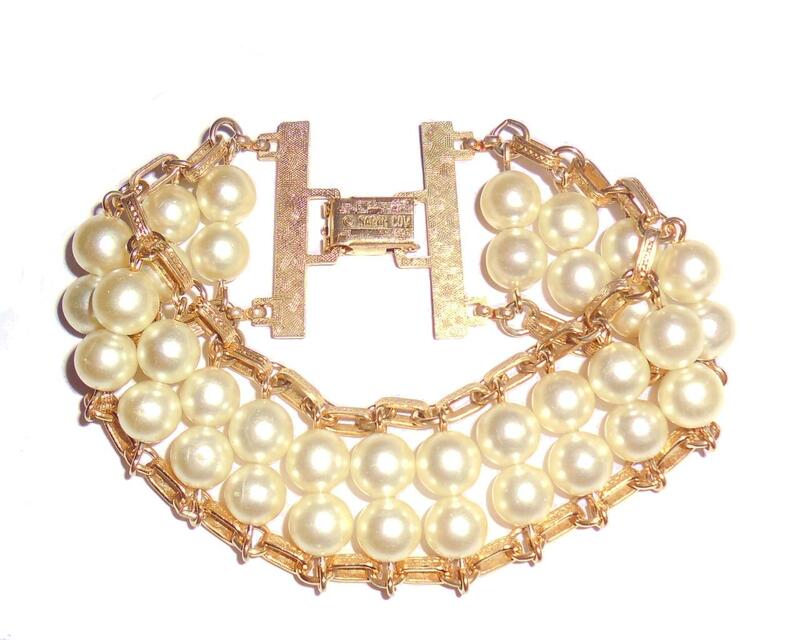 This is a stunning 2 row pearls bracelet for your vintage jewelry collection. 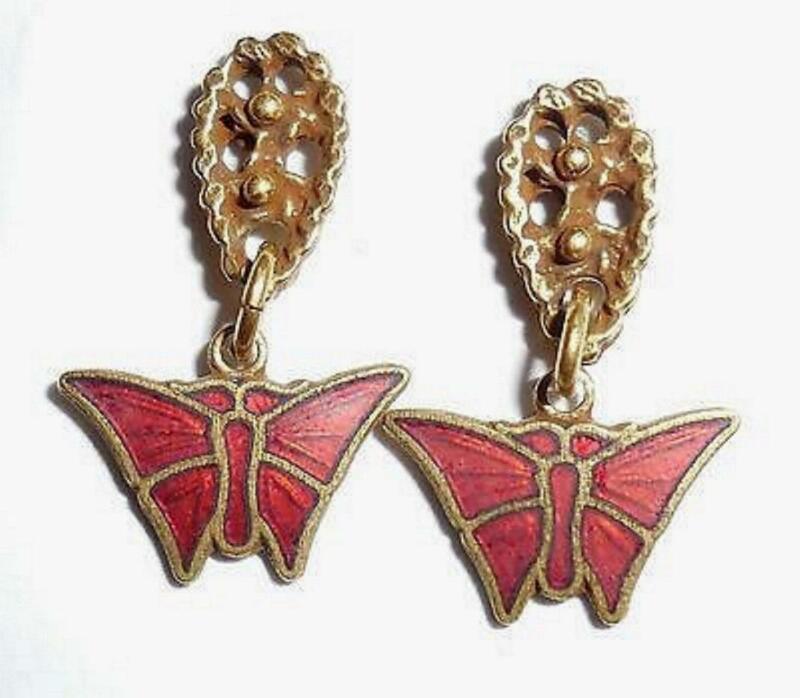 This is a small pair of vintage red enameled butterfly earrings with solid 10K yellow gold posts. Originally made in the 1970s for people with allergies to impure metals. Posts are jeweler tested and guaranteed to be solid 10K gold......not plated or filled. 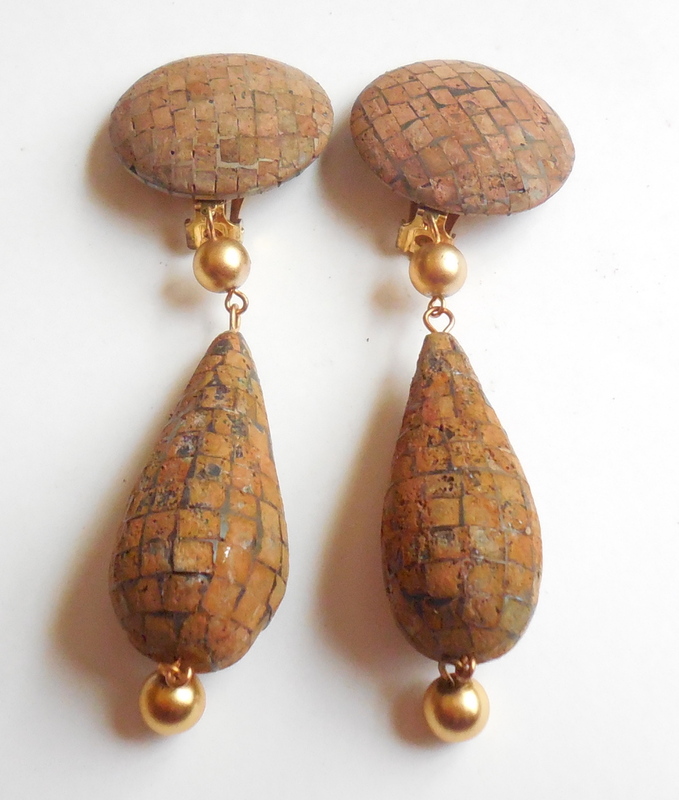 The rest of the earrings are enamel on brass. Size is 13/16" long from top to bottom of butterfly dangle. Width is 1/2" across the wing span. No wear. No damage. No repair. This is a lovely pair of vintage enameled butterfly earrings for your collection.